Reimagining traditional songs and tunes of the British Isles and its crossover into America in new and non-traditional ways, while respecting the beauty and integrity of the music by incorporating electric instruments and modern rhythms and harmonies. We are Na'Bodach (broad Scots for "not old men!") and we reimagine traditional music of the British Isles and its crossover into the US in new and decidedly untraditional ways, using both acoustic and electric instruments and drawing on influences as diverse as Funk, Progressive Rock, Celtic Folk, Blues and Classical. Formed in the late 1990s the band recorded two well-received albums. After a pause of about a year and some personnel changes Na'Bodach now is Casey Jones (Deger pipes, whistles and vocals), Bud Osthaus (Bass, flute and vocals), Glenn Owens (Guitar, Mandolin and vocals) and new members Mark Stewart (Bouzouki, fiddle and vocals), Randy Decker (Percussion, harmonica and vocals) and Wolf Hul (Violin and vocals). 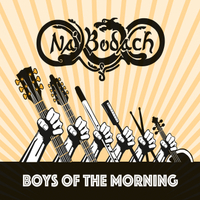 Boys of the Morning, our third album - our first since the band re-formed, includes more adaptations of traditional songs and tunes.